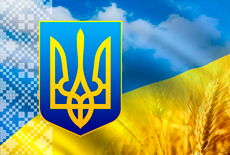 Home › News › Independence Day of Ukraine! Dear nationals! Congratulate you on the Independence Day of Ukraine! In this holiday was realized the age-old dream of Ukrainians – to be masters of their beautiful and magical land. Almost a thousand years, since the days of Kievan Rus, the Ukrainians wanted to live freely, to practice their traditions and customs, without feeling of hardship and oppression. Despite all the tests Ukrainians are struggling for their freedom and were able to get it. So, dear compatriots! We wish you health, happiness and success in all your endeavors and let the dream of a better life inspires you to new achievements, new good deeds in the name of our native and unique Ukraine, and its future generations. With great holiday you, dear!